Have you thought about including an open-air porch in your outdoor living project? It is currently one of the hottest requests from my clients. In recent years, probably 75% of the projects we’ve built included a screened-in porch, but the dominance of screened-in porches has shifted to porches that are open. If you haven’t considered an open-air porch as part of your outdoor living space, you may want to think about the features offered by such a porch. An open air porch is subtly different. It is like a piece of the outdoors brought partially inside. An open porch is covered with a roof structure, yet psychologically has an open feeling. Over the past two years we’ve built many different styles of open porches — porches with gable roofs, shed roofs, hip roofs, and the latest, flat roofs. Variations are numerous. We’ve had customers that want their porch painted, others who prefer stain, and some who ask for a combination of paint and stain. Furthermore, all of the desirable amenities of a screened porch can be built into an open porch. This includes electrical outlets, ceiling fan/light kit, TV, audio speakers, and a fireplace. What’s the difference between a screened-in porch and an open porch, besides one having screens and the other not? 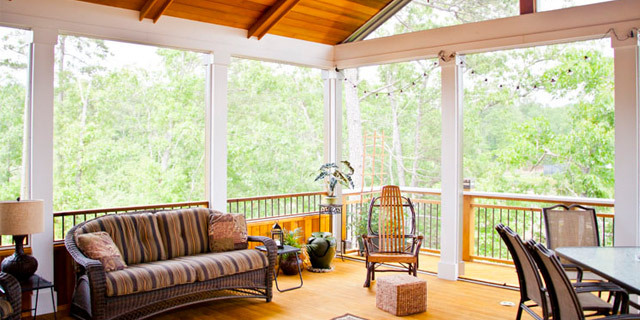 A screened-in porch is an extension of your house projected outdoors. It feels a little more enclosed and private, compared to an open porch. An open porch is subtly different. It is like a piece of the outdoors brought partially inside. An open porch is covered with a roof structure, yet psychologically has an open feeling. If your deck adjoins an open porch your usable outdoor living area is much larger than if it adjoins a screened-in porch — there’s no door and wall dividing the two areas. Another advantage we see involves grilling, a common activity on a deck or porch. Grilling, serving, and eating are more informal without screened walls, and spills are less traumatic. An open porch is like a park pavilion attached to your house. If that is too public and you want a little privacy from your neighbors, you can install a sliding curtain as a separator. A curtain adds color, texture, and versatility to a porch. There is at least one situation in which an open porch may not be advisable — If you have a back yard with a lot of mosquitoes or bugs. However, you can burn citronella candles or take other steps to minimize insect confrontations. The maintenance needed for an open porch is similar to that for a screened-in porch, which is less maintenance than required for a fully exposed deck. The floor and railing of an open porch is not exposed to the elements like a deck; therefore if you decide to stain the floor and railing, the coating will protect and look great for years to come. If you stain the ceiling, there is a good chance it may never need to be re-stained. Whether you include an open porch, screened-in porch, pergola, or no overhead structure at all, your outdoor living area should be an inviting space. It should be a place where you want to go, where your family and your company gravitates naturally because of its promise of pleasant comfort. A good view and tasty grillings will certainly lure people onto the deck, but so will two other characteristics: (1) lighting that adds practical elegance once the sun sets and (2) natural building materials. A dark deck/porch can be spooky and hazardous. This is not the atmosphere you want. Soft lights on steps, along railings, and on the porch roof will provide hours more use of your deck. We suggest installation of LED lights instead of incandescent lights. Some LED bulbs do not attract bugs or they attract fewer bugs. We suggest installation of LED lights instead of incandescent lights. Some LED bulbs do not attract bugs or they attract fewer bugs. We’ve come came across a couple of LEDs that are being advertised as bug repellent lights: Miracle LED 605023 LED Light Bulbs, Yellow, available from Amazon, Sears and a number of other stores, and Infinity Led Ultra Bug Light with 38 powerful LEDs, available through Overstock.com. You may find others by doing some research of your own. We’ve had good results by using Pharox 6 watt LED bulbs (this bulb is intended to replace a 60-watt incandescent bulb, although it only produces 360 lumens—less than half of what 60 watt incandescent would produce) and GE Reveal 10w, 400 lumens CFL (just a slightly higher output than the LED, it’s marketed as a 40w replacement). Another factor that can affect deck/porch usage is the material it’s made of. I’m partial to the natural appearance of wood. Vinyl and wood plastic composite decks can be very attractive – I’ve built many decks with them – but I try to steer my clients toward wood. Most of my projects are built of preserved lumber, but not the kind you typically see in a home center or lumber yard. We work directly with sawmills to get high-grade lumber with vertical grain. Then we have it machined on the surfaces with rounded corners and tapered sides. The result is a very good-looking project that invites you to make use of it. For anyone considering a new deck or an addition to their outdoor living space, consider an open-air porch. They are quite popular right now, and for good reasons. Their features make long-term sense and convince me that open porches are not just a trendy fad. Click here to read John Paulin's article about Open Air Decks recently published in Remodeling Magazine.